Image: Photo taken during 1945-1946 demolition. Number 10 House cone was originally built 1852-1854. The cone housed a four open-pot furnaces, each pot held three and a quarter tons of glass for making coloured patterned Rolled Plate glasses. 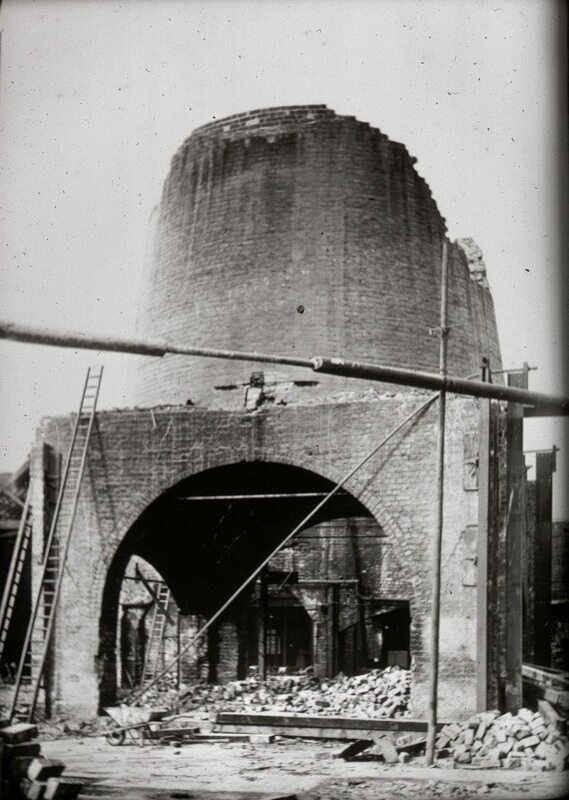 Note that the construction of the cone is somewhat different to the “English” cone at the Red House at Wordsley. The difference in design is to get the space for swing holes and to avoid glassmaking under the cone. Image from: Chance Brothers Glassworks, Smethwick Slides. Broadfield House Glass Museum, Kingswinford, Dudley (Slide and Transcript no 17 by Arthur Reeves).